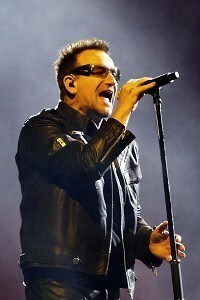 Bono has discussed poverty and drug violence in Mexico with the country's president Felipe Calderon. The U2 star, who is in Mexico for the final leg of the rock band's 360 Tour, visited the presidential residence Los Pinos on Thursday. A statement said Calderon and Bono also discussed global warming and Mexico's opportunities as the host of the G-20 reunion in 2012. The Mexican president thanked the Elevation singer for sending a message to victims of drug violence during his performance earlier this week, and wished Bono a happy birthday. The star turned 51 on Tuesday. Meanwhile, a revamped version of the troubled Spider-Man musical - which has a score composed by Bono and bandmate The Edge - was launched on Thursday with a cleaner script, tighter music and a more comic approach. The most expensive show in Broadway history, the musical had previously been savaged by critics and nearly defeated by a series of stunt accidents during an extended run in previews.